Some brave Canadians and Americans celebrate Halloween in a very unusual way. They take part in the pumpkin races that are held every year. 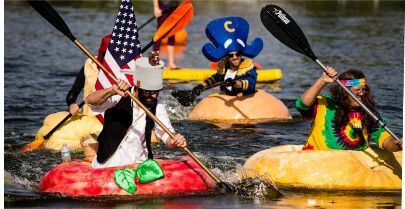 Competitors have to carve out their giant pumpkins and paddle across a lake in them. The aim of the game is to get to the other side without sinking. Test your idioms (тест на идиомы) → ← The preacher buys a parrot.